ORDER God, Improv, and the Art of Living from IndieBound, Amazon, Barnes and Noble, or the bookseller of your choice. Learn more about the Living Improv video series! The central principle of “yes, and…” in improvisational theater has produced a lot of great comedy. But it also offers an invigo­rating approach to life in general, and the spiritual life in particular. From Moses to Ruth to Jesus, Scripture is full of people boldly saying “yes, and . . .” as they accept what life throws their way and build upon it. Pastor, speaker, and improv aficionada MaryAnn McKibben Dana here blends Scripture, psychology, theology, and pop culture in a wise, funny, down-to-earth guide to improv as a practice for life. Offering concrete spiritual wisdom in the form of seven improvi­sational principles, this book will help readers become more awake, creative, resilient, and ready to play—even (and perhaps especially) when life doesn’t go according to plan. ORDER Sabbath in the Suburbs from Chalice Press, Amazon, or the online bookseller of your choice. Download a discussion guide for this book (PDF) here, and access five short videos to help supplement group discussion here. Dana, a Presbyterian pastor, brings a fresh voice and energy to the familiar topic of time management as understood by people who would describe themselves as either religious or spiritual but not religious: Sabbath-keeping. She writes from a perspective that many can relate to, that of a suburban mother of three who works part-time. Bringing the gift of self-awareness and irony, Dana notes that a four-minute difference in school bus rides ought not to prompt a letter-writing campaign from anxious parents. She also brings theological awareness of the historical practice and meaning of Sabbath-keeping. Dana writes in a distinct voice about making a traditional religious practice meaningful to contemporary families. 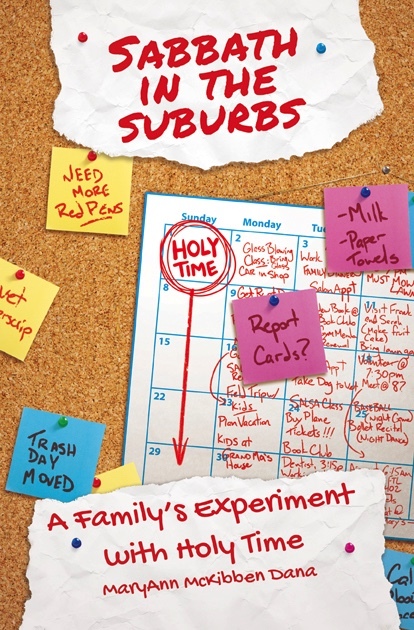 Sabbath In the Suburbs is the beautiful story of one family’s decision to spend a year exploring the meaning of keeping Sabbath. It is a powerful affirmation of living a life that does not just manage time, but embraces the moment. MaryAnn McKibben Dana writes with elegance, clarity and humor about the family’s search for a creative and workable Sabbath framework, while pondering the transformative and restorative quality of rest. It is a luminous reflection with deep resonance in our culture of perpetual motion.